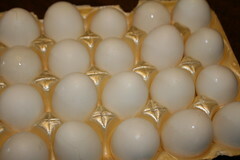 What do you do with a bunch of white eggs the night before Easter? Why you make them pretty, of course. We did this after a l-o-n-g day. We watched both sessions of conference. I ran to the store in between, in the rain, to get a few last minute things. We had a quick dinner. Then went to Ritter's for a treat for family date. After the eggs were done I cut both girls' hair. (You know, I think I do better than the place we take them to and I'm free.) I finally got them in bed and now I'm going to relax and try to make my achy body do the same. How did you get the sparkly eggs? And how about a picture of those haircuts? The amazing thing is that you cut your own hair too, right? 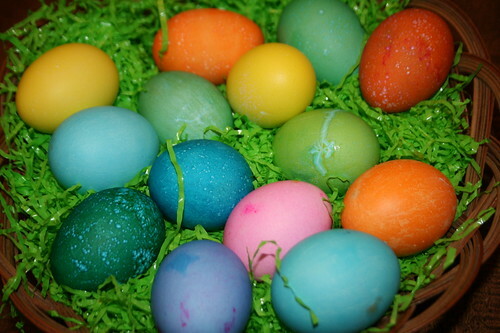 To get the eggs speckled, we left them in the dye for a long time. Nothing special. I will try to get a picture of the haircuts but can't promise anything. They're basically just bobs, modernized. I do cut my own too. I will have to invest in a tri-fold mirror for the next house.